Description: Hell Yeah! Tom Maxwell Concert Tour Signature Guitar Pick. Reverse side signature logo. 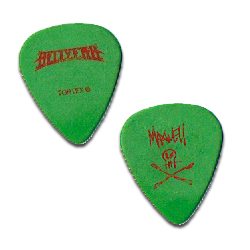 Description: Hellmet Concert Tour Guitar Pick. Reverse side CTT Logo. Description: Heritage Auctions Promo Guitar Pick. Description: Hootie And The Blowfish Concert Tour Guitar Pick.